The Salaka Ensemble of Ghana was formed by Master Drummer Tuza in Nungua, Ghana in the mid-1990’s – when the members were young teenagers. Every day after school the group would rehearse, learning rhythms from their local elders and community cultural groups. The name Salaka means “Sharing”. As Ghana is becoming more Western, there is a danger that the beautiful rhythms and dances, so important to African music and cultural heritage, may be lost. In order to preserve this rich heritage, Tuza devoted his energy over many years to Salaka amidst resistance from parents who felt drumming was unimportant. Salaka quickly grew into an exciting display of culture and pure talent, performing at festivals and special events in Ghana, and are now a highly esteemed force in their community. Salaka has had the honour of performing for President Kufuor at his castle in the capital city of Ghana, have won numerous drumming competitions and were chosen to lead Ghana’s 50th independence anniversary celebrations at Black Star Square in the capital city, Accra. As a result of Salaka’s success and wide-spread recognition, many of its members now support their families through their music, making their parents proud and inspiring their community. 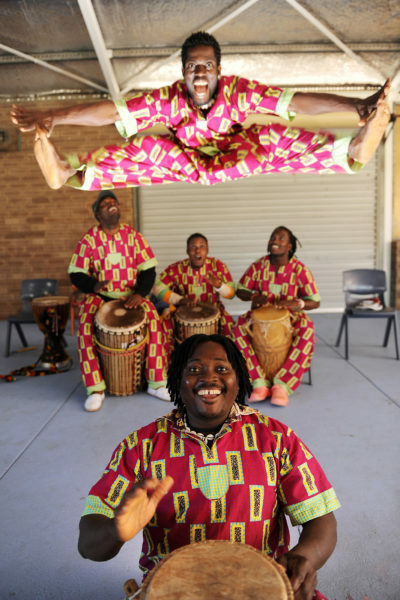 Salaka Drumming is Salaka’s annual tour to Australia. Each year since 2008, 3 members of the group travel to Australia, spending around 5 months touring the country. They are passionate about sharing their culture with Australians, learning more about the Australian culture and supporting their families back in Ghana with proceeds from the tour. Salaka will be on tour in Australia throughout this year.